Many times we are worried about our facebook profile as facebook seems to our good friends .We share all our thoughts on it .But some bloody hackers hacked our account and change our profile picture with some dirty photo and wrote some abuse language on it.Dont worry here i comes with some solution for it.I have six tips to improve your facebook security.It just only some feature by Facebook which help us to avoid hackers from our profile. Login Notifications are an opt-in security feature where alerts are sent to you each time your account is accessed from a new device. 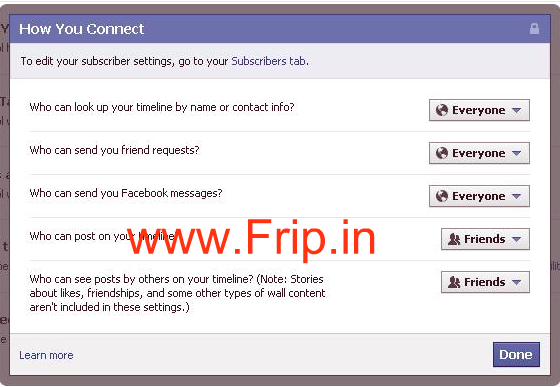 In the Previous Facebook it was very difficult to to enable login notification for a facebook account .First we have to register our computer with some name to get this security feature .But now facebook have upgrade this feature with some easy steps.Now you can enable this feature with in some 2 steps. Just Go to your Account setting >>security >>Login Notification >>Click on Email>>Click on Save. After you turn On Login Notification facebook will ask you to name your computer when you login next time on your facebook account.you can also save this device in the list of your recognized device.When you named the computer facebook will send you a notification to the email address associated with your account . Note: Please dont select the option save your device when your are using facebook from cafe. Secure Browsing (https) is an opt in security feature.When you turn on feature ,the activity which done on facebook is encrypted which is harder for anyone to access anyone which your permission . Just Go to Top right corner of your facebook >> click on Account setting >>security >> mark the box >> save your changes. Public search is just a feature which show a preview of your profile in the search engine when someone search by your name.In the past few days Google started showing Profile search results in the Search results.As a competitor facebook also enabled this feature in their site and when person search a name’s on search engine he will get your facebook profile results.But for the privacy concern we recommend you to disable this feature . Many times we use games application and other more funny apps on facebook but there are many scam on going on facebook which can affect us in many ways.They can steal our information and used it for any terrorist attack.So to overcome from it you have to remove not important facebook application from your facebook profile.It will safe your information on facebook. Just Go to Top right corner of your facebook >> click on Privacy setting >>Apps and websites >> Click on Edit Setting >> Click on To Remove To Remove the Application. While surfing Facebook we find lots of friends which may we like but some of them are trying to irritating us by asking same question which we had answered earlier lots of times.So to Manage these kind of friends facebook has feature called Block People and apps.So what exactly this feature do? When you add your friend in the Restricted list they can see your posts only when you make public.Facebook will not notify your friends that you had blocked him from your profile. Just Go to Top right corner of your facebook >> click on Privacy setting >>Blocked people and Apps >>Manage Blocking >> Add your friends name and email in field required. Facebook Tag feature allow user to tag someone on any pic which user want to show it to their friends.But sometime it become very harsh to see photo on facebook as the photo contain some bold content or abused language is used by user.So to overcome from this facebook has feature called How You connect which is most popular in the world.Just set “friends “in this feature from “everyone”. You can also control who can post on your timeline,who can send you friends request,who can send you facebook messages and many more….